Looking forward to seeing some ‘RAW’ talent! Despite some of life’s recent challenges , I’m still focused and enjoying the process of being creative. Over the last few months, I’ve had the opportunity of working with a few companies on branding designs, websites and collaborating on ventures designed to support small businesses and entrepreneurs in London. I’m also excited by the opportunity of working on a very interesting private commission in Denmark. Hopefully I’ll be over in a few months to start this whilst seeing friends perform at the Copenhagen Jazz Festival. 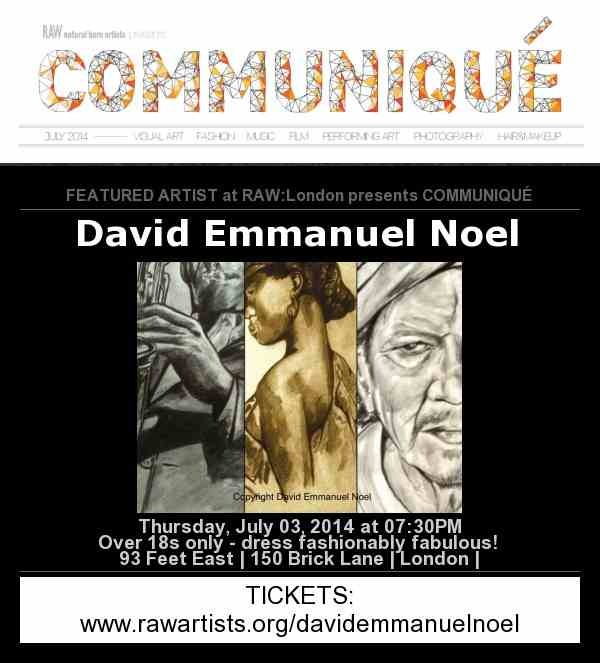 I’m equally excited to be a featured artist in the forthcoming ‘RAW’ arts event in London’s Brick Lane this July. Moreover, there’s a chance I’ll be part of an event later this year on my return to New York. RAW: natural born artists, is an independent arts organisation for artists, created by artists. It currently operates in nearly 60 cities across the US, Canada, Australia and now London! It’s an international community made up of creative individuals across the globe with a mission to provide independent artists with the tools, resources and exposure needed to inspire and cultivate creativity. All genres of art including independent film, fashion, music, visual art, performing art, hairstylists, makeup artists and more are included in bespoke, one evening events that showcase some of the most creative individuals in each city. I’m privileged to be part of this creative family and look forward to the show. Hopefully I will be honoured to see some of you there!! Wishing you all a great week, May it be a step closer to turning your dreams into realities!